Polyhedral models in the book Polygons and Polyhedra: Theory and History (Vielecke und Vielflache: Theorie und Geschichte) by Max Brückner, 1900. 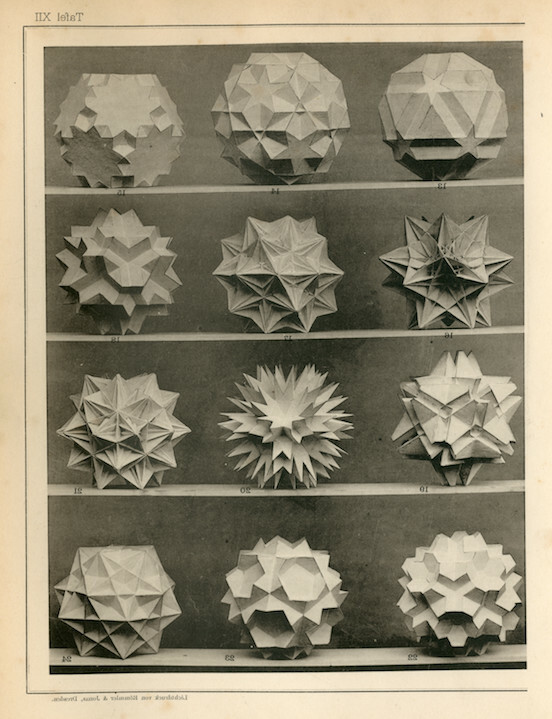 Brückner was a German geometer known for making many geometric models of polyhedra (solid shapes with many plane faces) and stellated polyhedra (shapes in which the edges and planes have been extended outwards). Image credit: Bodleian Libraries, University of Oxford. Thinking 3D explores technological advances up to the present day including 3D modeling, photography and stereoscopy; and also highlights the works of modern practitioners and researchers in Oxford. The list of drawings by Leonardo da Vinci on loan from the Royal Collection and currently on show is available here.